Most think of Aspen, Colorado as a place to hit the ski slopes with celebrities, but Aspen's fishing is stellar as well, attracting serious anglers from far and wide. Expert guide service offering float & wade trips on the Colorado, Roaring Fork, and Frying Pan Rivers,and private lake trips for some of the largest trout in Colorado! Full day and half day Guided Colorado fly fishing trips on the Roaring Fork, Frying Pan and Colorado Rivers. Horseback trail rides, pack trips, hunting, and fishing adventures. All trips center on the remote Maroon Bells/Snowmass wilderness areas. All that famous Aspen, Colorado powder has to melt eventually, so you know there are high-mountain lakes, streams, and rivers that receive cold, mountain water and that means good trout fishing. From the Roaring Fork and the Frying Pan to backcountry waters like Ivanhoe and Granite creeks, there is something for everybody. 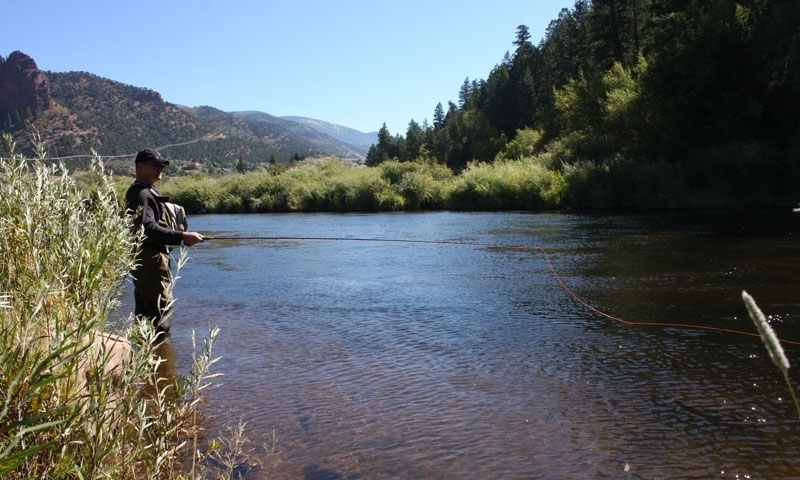 Most waters near town and in the high country offer smaller trout, but a wild experience. Smaller waters can really build your confidence. Popular waters like the Frying Pan's tailwater section below Reudi Reservoir is as good as a river can get. It fishes well year round. Other waters in the area are impacted by natural runoff in spring. The Frying Pan and Roaring Fork steal the show with wade and driftable waters, not to mention trophy trout measured in "pounds" instead of "inches." The bonus of fly fishing a tailwater like the Frying Pan, is that it sees regulated flows making it a viable option year round. Runoff will plague the Roaring Fork for at least three months in spring. The best time to target these waters in one trip is in late summer, August and September, or early spring. You'll need to bundle up because March will still be icy. Browns and rainbows dominate the catch around Aspen. Smaller waters will yield eight- to 13-inch trout, while bigger waters and reservoirs will produce trophy fish to 28 inches. Special regulations are in place, especially on the Frying Pan. Aspen is home to lots of private property, but accessing the waters in the national forest or hiking up a trailhead will bring you to public water. The Roaring Fork, Frying Pan and Reudi Reservoir all offer easy access. Hit the "Pan" above and below Reudi or book a drift for the Roaring Fork.